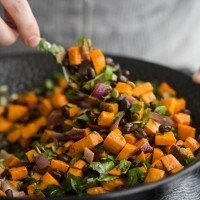 Black Bean Salad with Roasted Sweet Potatoes | Naturally. This salad has been a staple in my kitchen for years. 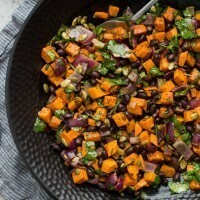 Back then, I was looking for an alternative to potato salad for a picnic when I stumbled upon this sweet potato salad from the New York Times. 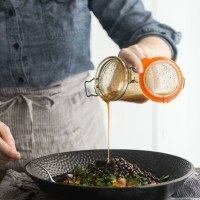 As I will make anything that contains sweet potatoes, cilantro, and black beans, I was immediately won over. 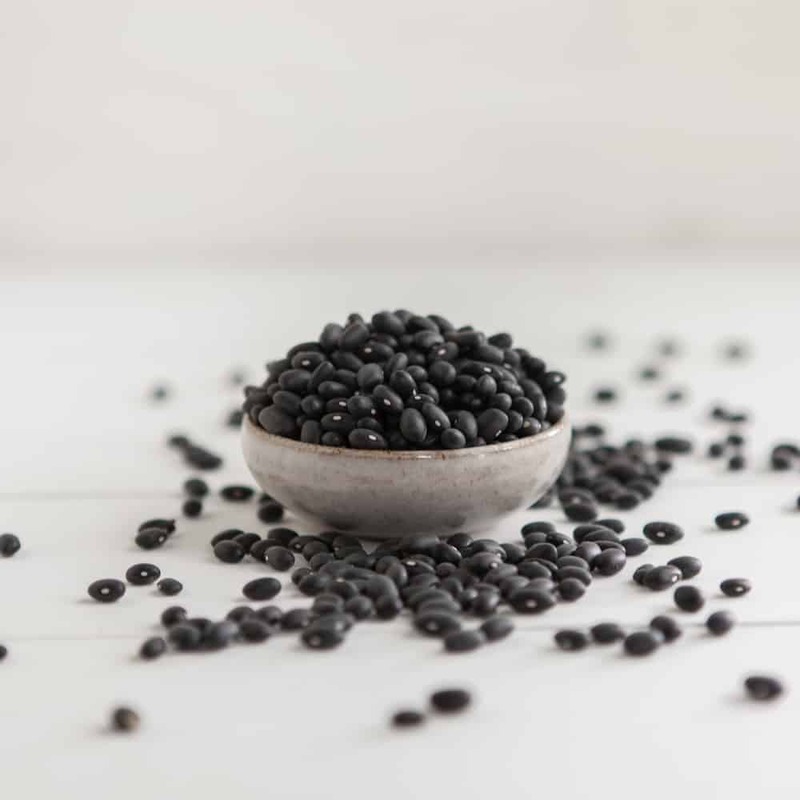 As a result, this black bean salad gets made quite a bit in our house. Often, I eat it as is, serve it over grains, throw it in an omelette, or stuff it in a taco. It’s both versatile and full of flavor. While this salad is already a slight variation of the original recipe, I’ve found that the best variations are in how you can use this salad (besides just eating it). One note, if you’re in a hurry, you could always steam the sweet potatoes. But roasting them is really key to bringing out the flavor! Tacos: Heat up a few tortillas, fill with this salad and top with avocado, cheese, and hot sauce. Instant dinner! Eggs: Make scrambled eggs or an omelette and use this salad as filling (I recommend leaving out the pepitas for this variation). Grain Bowl: Serve this salad atop grains. Then drizzle with an avocado cream sauce or a few dashes of hot sauce. 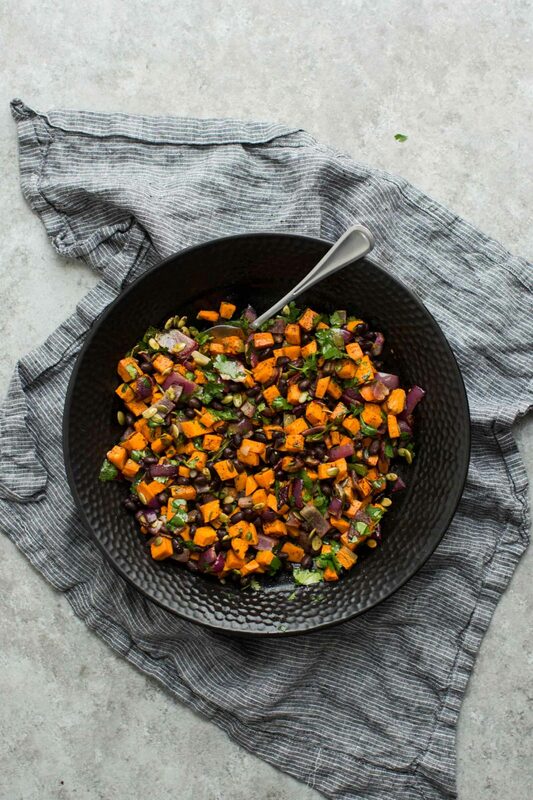 The perfect picnic salad, this black bean salad is vegan and gluten-free made with roasted sweet potatoes, fresh cilantro, and an easy spiced dressing. 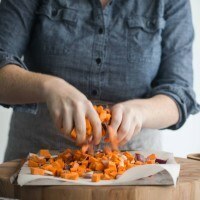 Once sweet potatoes are done, transfer to a bowl. 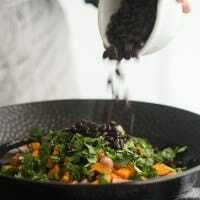 Add in the black beans, pepitas, and cilantro. Drizzle with the dressing and toss until salad is combined. This is best done with the sweet potatoes are still warm. 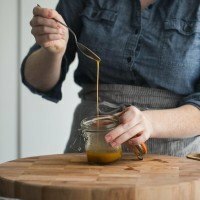 Tips & Tricks: Double the recipe to use in meals throughout the week. Link: Recipe adapted from this NY Times recipe. First published on June 6th, 2011. Last updated on January 14th, 2015. This looks sooo amazing!! I am definitely going to be trying this one this week! Thanks so much for sharing! Yup! Switch to the new design a little over a week ago! I feel exactly the same way – bbq’s can so boring and fattening, for no good reason when there’s so much beautiful produce to be had! I had a similar experience to you, showing up at a family gathering this weekend with two very healthy (one vegan) side dishes. My cousin, a trained chef, could not believe how good these healthy dishes were – I guess he only learned butter and cream in culinary school! 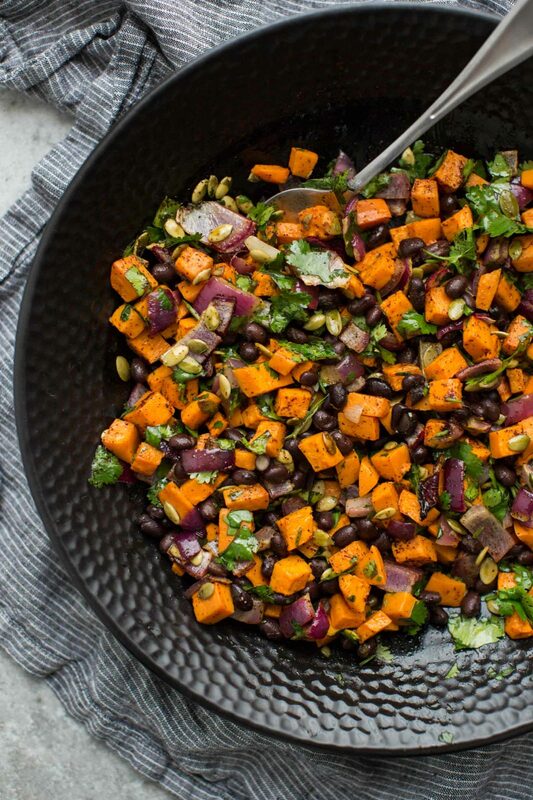 This salad sounds right up my alley, I adore sweet potatoes and black beans. Happy summer! Two of my favorite things: sweet potatoes and The New York Times. Yum. I am so glad I stumbled upon your blog. 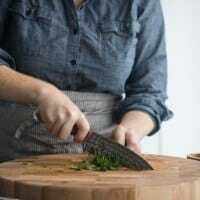 Your photos are just beautiful & the recipes looks so yummy and healthy. I can’t wait to try this one and pinned it for later! Yum. Again I say yum. It looks amazing. I love sweet potatoes and I love black beans. And I like all the ideas that you gave to use it. Will be trying this over the weekend. I made this tonight and it was so good! My son asked what was wrong when I made a yummy noise after taking a bit. Yum, yum, yum. Hoping it tastes just as good with my eggs in the morning. HA! Love it. And I hope you enjoy it with the eggs- it’s one of my favorite variations! Hi Erin, I just wanted to let you know I took this to the potluck today at Church and everyone that tried it loved it. It traveled easy, I served it at room temperature. It will definitely be something that I take again. This was de-LISH!!!!!!!! Think I’ll toast my pepitos next time and will fine tune the cook time for the veggies so the sweet potato isn’t overly squishy!….My bad! my son (22 yrs old) and i loved this and have already decided lunch tomorrow will be this as a quesadilla with the chicken this accompanied! This looks delicious! Seems like a very easy dish to making during the week. I’ll post about it after I make it! I made this recipe last night, and just finished the leftovers for lunch. I have to say, it was really, really good. Followed the recipe exactly, and will definitely be making this again very soon with no changes 🙂 Thank you for your wonderful blog!!! Is this salad good the next day cold? Or did you warm up in a pan? I’ve had it both warm and cold- it’s great either way! more spice. I put 4 times more chili powder, some red pepper flakes and about 3 times more garlic. [ I have to keep the Vampires away ] Being a diabetic I use one medium sweet potato and then add lots of carrots to keep the starches down. 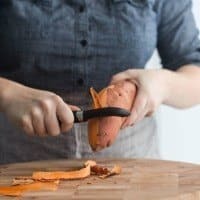 I also slice my sweet potatoes in round slices just prefer to have it that way. I like it warm but I like it better cold because the spices have time to mingle better. I love roasted veggies they taste so good. It is in the oven as I am typing. Try it you will love it. It’s in the first paragraph- I roast it with the sweet potato! This looks delicious. I’m going to make it today. Do you use raw or toasted pumpkin seeds? Thank you! I’ve made this twice now and loved it. Thanks for the recipe! Just what I was looking for! I found it on Pinterest. Can’t wait to try it 🙂 Thank you! I don’t like onions, but I will definitely be making this minus the onion. And pumkin seeds are my new favourite! 🙂 Thanks girl! Is this supposed to be a warm salad or is it still good cold? Could you make it ahead of time? It’s wonderful as both- you could easily make it ahead of time. Made this for dinner last night, it was SO GOOD. My husband loved it, too! This salad is packed with flavour. 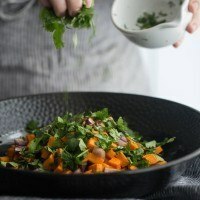 The sweet potato is in perfect pairing with the cilantro. The kick from the chilli powder is subtle but present, and I love the crunchiness of the sunflower seeds (replaced the pepitas). I’m definitely doing this again! Made this tonight, and its excellent. So many sharp acidic flavors balanced out by this mushy sweet potato. The first taste test, I almost teared up. I’ve made this several times and always double it. It’s too good not to. The only change I make is to increase the amount of garlic, because I believe everything should have more garlic in it, and unless I’m serving it to vegan guests, I offer cheese (feta, parmesan, and cheddar are all good) to top it off. I love the texture, colours, flavour, how quick it is to put together – I love everything about it. Thanks for sharing it! I really enjoyed this! Question, though, I noticed that the serving yield is 2, but the nutrition information shows that it serves 4. 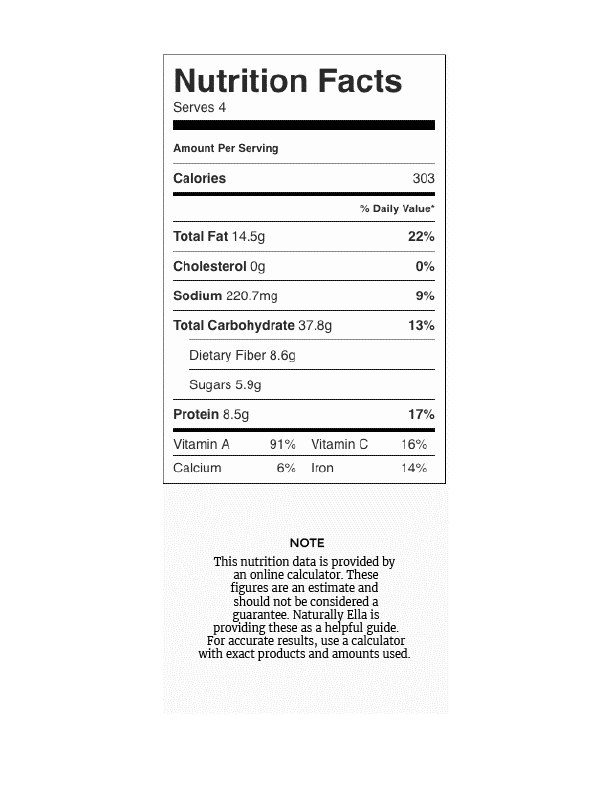 Is 303 the calorie breakdown if the recipe is divided into two or four portions? Thanks! Four! I just updated the recipe. 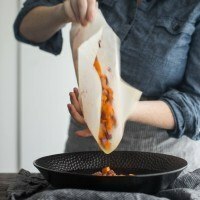 This is absolutely amazing, so easy to make and tastes delicious. thank you!